The monasteries of Tatev and Tatevi Anapat and the adjacent areas of the Vorotan Valley is part of the Tentative list of Armenia in order to qualify for inclusion in the World Heritage List. Visited in the summer of 2012. Very beautiful and well preserved monastery in an area full of impressive monasteries and definitely a highlight of a visit to southern Armenia. Didn't take the cable car but it was accessible by bus from Goris and made an easy 1/2 day trip. Whether or not it makes the WH list (it should) the setting was stunning and quite peaceful and worth the visit. Easily hitchhiked back to town as I recall. One of best preserved monasteries in Armenia. Additional attraction is the famous "Wings of Tatev" - the longest cable car in the world (be prepared to long queues in the high season). 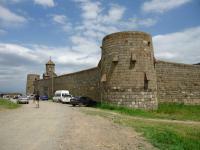 Access to the monastery is by chartered taxi (from Goris or Sisian, expect to pay around 8.000 AMR for return trip). Tatev is magnificently situated in the mountains, it is also one of the most visited sites in Armenia, so it is better to avoid weekends, especially during holiday months.